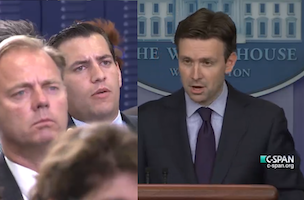 During today’s White House press briefing with Josh Earnest and moments after initial reports that American journalist Steve Sotloff was beheaded by ISIS, TIME’s Zeke Miller asked Earnest about the reports or for reaction, which the White House press secretary had yet to learn or see. Sotloff was a freelance journalist and had contributed to TIME, for which Miller is a political reporter. Miller later retweeted a TIME statement by editor Nancy Gibbs, tweeted moments earlier by Andrew Katz. News of Sotloff’s apparent murder comes two weeks after the same group beheaded American photojournalist James Foley. Click here for C-SPAN coverage of today’s press briefing, with Miller’s question at the 15:30 mark.